The soundtrack to the fashionista-turns-stepmom dramedy Raising Helen is a standard-issue one, mixing a few old favorites with some new teen pop and singer/songwriter fare. Devo's "Whip It," David Bowie's "Fashion," and Simon & Garfunkel's "At the Zoo" sit next to songs like Five for Fighting's "Sister Sunshine," Kristyn Osborn of SHeDAISY's "Whose Life Am I In," Fefe Dobson's "If You Walk Away," and Haylie Duff's "Sweetest Pain." Liz Phair's "Extraordinary" proves once again that she's viable as a quasi-teen pop star, even if this single isn't quite as convincing as "Why Can't I?." John Hiatt's "Feels Like Rain" and Joan Osborne's "Stand Back" give the soundtrack more substance, while tracks by Josh Kelley, Dana Glover, and Ingram Hill round it out. On its own, Raising Helen is a pleasant yet somewhat anonymous collection of songs, but fans of the movie might find it more enjoyable. Track 1 published by EMI Virgin Music, Inc. o/b/o EMI Virgin Music Ltd. / Devo Music (BMI). Produced under license from Warner Bros. Records Inc. by arrangement with Warner Strategic Marketing. Licensed courtesy of Virgin Records Limited. Track 2 published by Sony/ATV Tunes LLC / Civil War Days Music (ASCAP) / Warner-Tamerlane Publishing Corp. (BMI) / Rainbow Fish Publishing (BMI) / Hollylodge Music (BMI). Courtesy of Capitol Records, under license from EMI Music Special Markets. Track 3 published by Warner-Tamerlane Publishing Corp. (BMI) / Grave Lack Of Talent Music (BMI) / Zomba Enterprises Inc. / Massif Music (admin. by Zomba Enterprises Inc.) (ASCAP) / R. Nevil Music (ASCAP). Courtesy of Atlantic Recording Corp.
Track 4 published by EMI Blackwood Music Inc. o/b/o itself and Five For Fighting Music (BMI) / Songs Of Peer, Ltd. / Bungalow A Music (ASCAP) adm. by Songs Of Peer, Ltd. / Werty Music. Courtesy of Aware Records / Columbia Records by arrangement with Sony Music Licensing. Track 5 published by Buena Vista Music Co. (BMI) / Touchstone Pictures Music & Songs (ASCAP) / Mentalcase Music Ltd. (SOCAN) / Sony/ATV Music Publishing Canada (SOCAN). Produced for Lefthook Ent. Courtesy of The Island Def Jam Music Group. Track 6 published by Emerto Music (ASCAP) / WB Music Corp. / Dylan Jackson Music, admin. by WB Music Corp. (ASCAP). Courtesy of Lyric Street Records. Track 7 published by Careers-BMG Music Publishing, Inc. (BMI). Courtesy of A&M Records under license from Universal Music Enterprises. Track 8 published by Dudeskimusic (ASCAP). Track 9 published by Paul Simon (BMI). Courtesy of Columbia Records by arrangement with Sony Music Licensing. Track 10 published by Dana Glover Music (ASCAP). Courtesy of DreamWorks Records under license from Universal Music Enterprises. Track 11 published by Touchstone Pictures Music & Songs, Inc. (ASCAP) / Buena Vista Music Co. (BMI) / Lushmole Music (BMI) / Hillabeans Music (ASCAP). Track 12 published by Peermusic III, Ltd. / Shellayla Songs (BMI), adm. by Peermusic III, Ltd. / Famous Music Corp. o/b/o itself and Ash Bell Music (ASCAP). Track 13 published by Tintoretto Music administered by RZO Music Inc. / Screen Gems-EMI Music o/b/o EMI Music Publishing Ltd. (BMI). Courtesy of EMI Records Ltd., under license to EMI Special Markets. Track 14 published by Universal-MCA Music Publ., a division of Universal Studios, Inc. / Universal-PolyGram Int. Publ., Inc. (ASCAP) / EMI Blackwood Music Inc. o/b/o EMI Publishing Ltd. (BMI). Courtesy of Palm Pictures Special Markets. Track 15 published by Thor Hill Publishing (BMI) / Lonely Runner Music (BMI). Motion picture artwork, TM & Copyright © 2004 Touchstone Pictures. Photos copyright © 2004 Holding Pictures Distribution Co. LLC. This compilation ©℗ 2004 Hollywood Records, Inc. Manufactured and marketed by Hollywood Records. Place this CD in your computer's CD-ROM drive to access special features. 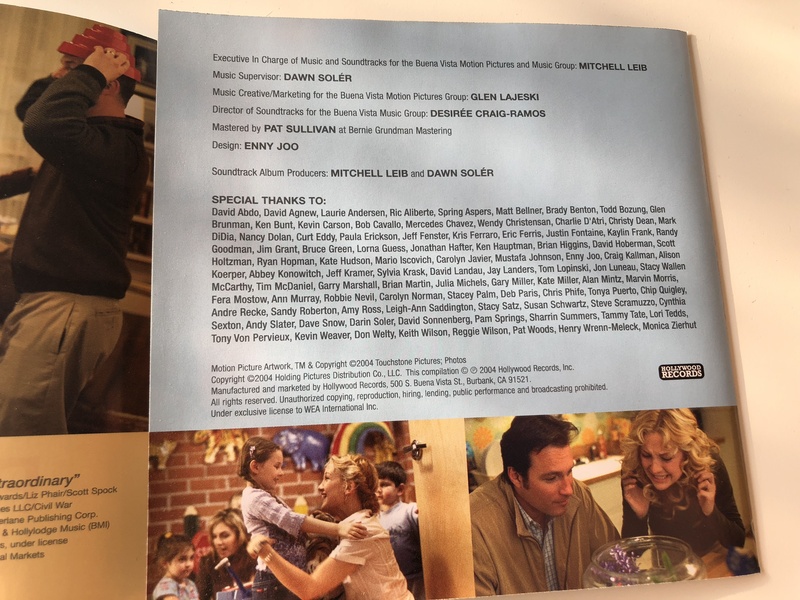 Click the button below to add the Raising Helen / Original Soundtrack / Audio CD 2004 / Producer: Dawn Solér, Mitchell Leib / Various Artists / Composer: John Debney, Mark Vogel to your wish list.